Double nano scale surface plating, acid and alkali resistance, oxidation resistance. Phiestina use imported ceramic disc cartridge of can survive 1000,000 times open & close test. Sophisticated ceramic engineering provides both convenience and control precision. ❤UPGRATE: METAL PUSH & SEAL POP UP DRAIN INCLUDED❤-- The whole drain is made of copper to offer durable use without leaking. Updated pop up drain is easier to install and use than traditional lift road drain. ❤CREATIVE QUICK CONNECT TECHNOLOGY❤--Original creative fast connect construction is easy to install by yourself without a plumber! 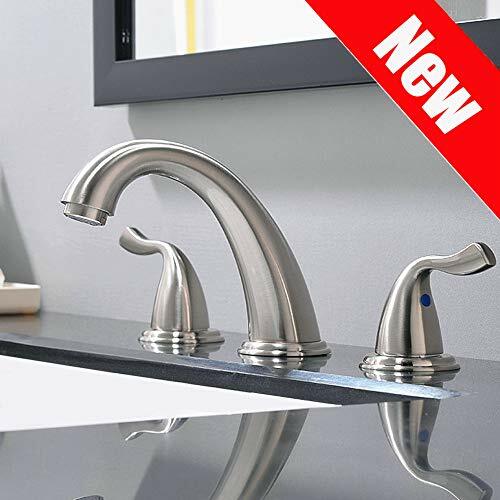 SAVE PLUMBING INSTALLTION FEE WITH PHIESTINA FAUCET! ❤3-Hole Mount With 8-inch Widespread Design❤ -- For Easy Installation. ❤ROW MATERIALS HAVE CERTIFIED TO CUPC AND NSF 61 STANDARD❤--phiestina offer you lead free faucet to protect you and your family's healthy from daily use. If you have any questions about this product by phiestina, contact us by completing and submitting the form below. If you are looking for a specif part number, please include it with your message.